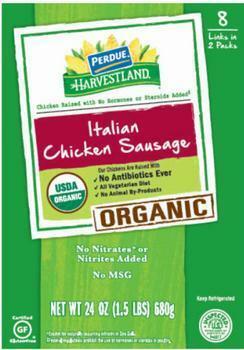 Perdue Foods of Gainesville, Ga., is recalling approximately 2,148 pounds of chicken sausage. The company reports receiving three consumer complaints of blue plastic materials in the sausage. There have been no confirmed reports of injury due to consumption of these products. 24-oz. plastic packages containing eight links of fully cooked ready to eat “PERDUE HARVESTLAND Italian Style Organic Chicken Sausage” bearing package code 64405 and a sell or freeze by date of 6/25/17. The recalled product, bearing establishment number “P-2617” inside the USDA mark of inspection, was shipped to a retail distributor in Connecticut and Maryland. Consumers with questions about the recall may contact Perdue consumer relations, at (877) 727-3447.